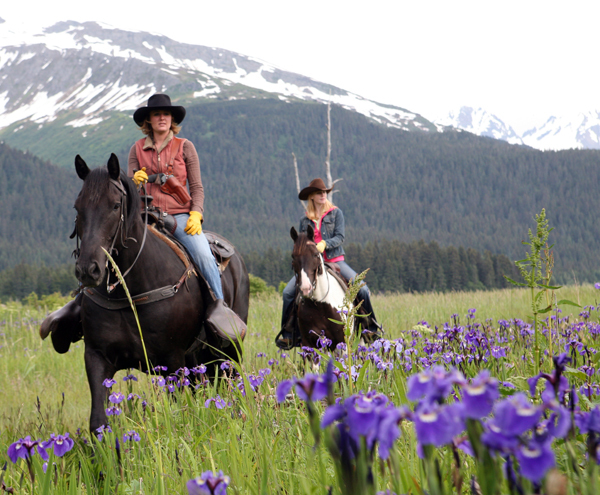 Bree Bardarson of Bardy’s Trail Rides was born and raised in Alaska. 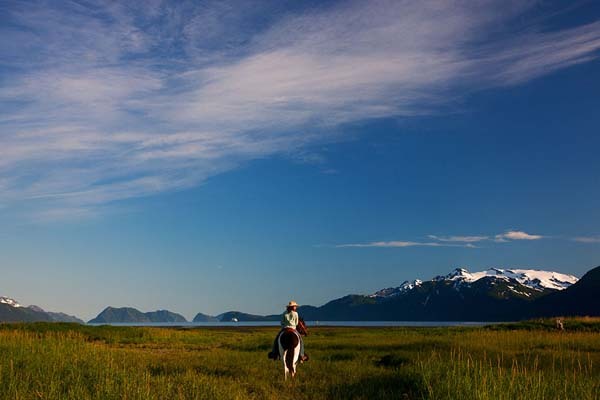 As an Alaskan native and horse lover, she was a great guide on my horseback ride through the beautiful natural areas surrounding the town of Seward on Alaska’s Kenai Peninsula. On our ride, we discovered areas of devastation caused by the 1964 earthquake and rode on the beach. Who would have thought about beach riding in Alaska! 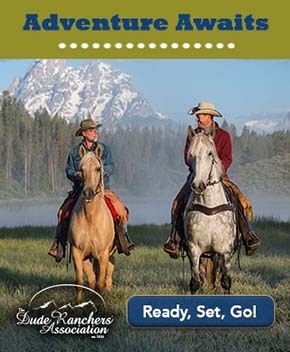 If you get the chance to ride with Bree, be prepared to take in a variety of wildlife and be on the lookout for bears. I rode a five-year-old Tobiano Paint horse named Orca, who was wonderful. Bree rode Max, a big, black 16-year-old Percheron Quarter horse mix. Passing by Resurrection River on our way to the beach, Bree talked about growing up in the small town of Seward and pointed out Mount Marathon, where there is an annual Fourth of July race up the mountain and back down. Yes, people do travel here to run up and down a mountain. It’s a tradition. Bree has run twice now. In 1964 Alaska was rocked by a giant earthquake and then tsunami. The Good Friday Earthquake measured 8.4 on the Richter scale, and it devastated the small, harbor town of Seward. We rode by some rusted old cars, which had been thrown into an area that used to be residential and was now only woods. Bree told me stories of people who survived the natural disaster and of some who did not. Down by the water, only one old green building still stands. "This building in front of us was built in 1917, and it was used as a communications center during the war," Bree said, as she swayed back and forth on Max. "They communicated back and forth with the bunkers that are at the entrance of the bay to protect this bay as a port. It was also the only building to survive the tidal wave on this side of the bay." Bree carried a gun on our ride, something new for me. It was in case of any encounters with bears. A couple of days ago in the same area where we were riding, one charged Max, the horse that she was riding. Her horse Max is quite large. Bree told me that Max did exactly what you want a horse to do if charged by a bear. He charged back and then Bree and Max were able to escape unharmed. Yikes! Bree and I didn't see any bears on our ride and were glad about that. Our crew, who were sometimes separated from us, carried bear mace just in case. "There’s bears all over the place and they’re watching you. They’re stalking you, but uh you don’t know it and usually the horses don’t know it. They keep their distance," said Bree. Bree statement made me feel a little nervous, as we passed through a thicker section of woods. Instead of any bears, we saw saw two majestic bald eagles in circling their nest up above in a spruce tree. They had just had a baby and were flying around and keeping watch, letting out sounds akin to a squeaky hinge. I have seen more eagles in Alaska than I have ever seen before in my life, and it's even more amazing to be able to get relatively close to them on horseback. Bree took me through a marshy area and we had a short canter on one beach before heading to a farther beach to see the hundreds of Arctic Tern. The Arctic Tern is a bird that flies all the way from Antarctica to Alaska, approximately 25,000 miles, to lay their eggs, have their babies and then fly back. That’s a long trip! These birds aggressively protect their eggs by dive-bombing any potential predators. They did this when Bree’s dog and Greg, our cameraman, got too close. Greg almost lost his hat. From the beach, we could see the small harbor town of Seward, where we would spend the next few days, in the distance. We headed back to the woods, riding through lupin, bright purplish blue flowers and other wildflowers in bloom. The wildflowers make Alaska so pretty in the summer, especially when juxtaposed with snow capped mountains. 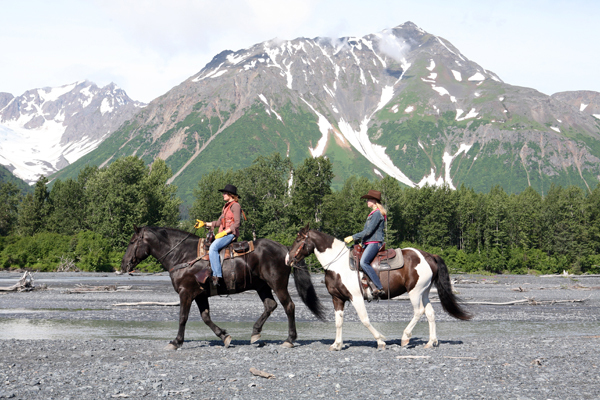 How you can go: Learn more about horse riding in Alaska with Bree Bardardon of Bardy's Trail Rides at www.sewardhorses.com and on Bardy's Trail Rides Alaska horse riding page in the Equitrekking Vacation Guide. 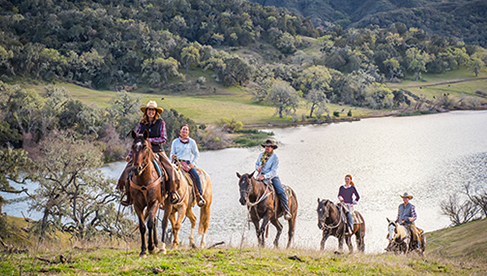 About the Author: Darley Newman is the host and producer of the Emmy Award-winning Public Television series Equitrekking®, which takes viewers on horseback riding vacations around the world.